Woman on bed; image by David Cohen, via Unsplash.com. As the opioid crisis worsens, safety measures to help avoid over-prescribing are necessary. PDMPs and pharmacist/physician education are two means of tackling the issue. According to the latest data from January 2019, more than 130 people die from an opioid overdose in the United States every day. In October 2017, when the president declared the opioid crisis as a national public health emergency, the approximate number of opioid overdoses each day was 90. In just three months, the number of daily overdose deaths has skyrocketed. Although these overdoses include both illicit and prescription opioids, many individuals who suffer from opioid use disorder abuse prescription opioids before they turn to illegal substances. The National Institute on Drug Abuse reports that opioid prescriptions are misused by approximately 21-29% of patients with chronic pain and between 8-12% of those patients will develop a dependence on or addiction to opioids. These numbers are devastating. They are only getting worse as time goes on. Regulations on prescription opioid distribution need to be examined and revised in order to begin to tackle the opioid crisis. Despite the fact that it is common knowledge that opioids are highly addictive, there are still severely high numbers of opioid prescriptions being written by physicians and distributed by pharmacists. The Centers for Disease Control and Prevention (CDC) reports that approximately 58 opioid prescriptions were written in 2017 per every 100 Americans. Although a physical dependence on opioids can occur after only 5-7 days, the average prescription contained enough medication for 18 days. 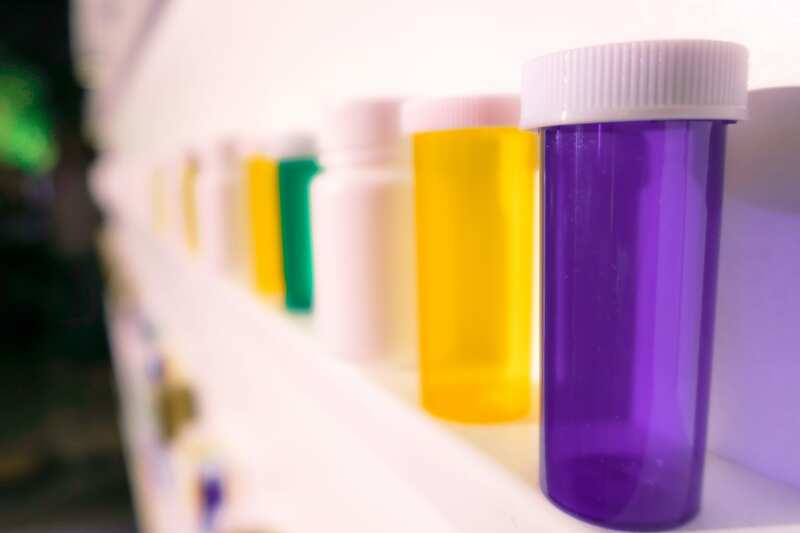 Empty prescription bottles on a shelf; image by Joshua Coleman, via Unsplash.com. Perhaps opioids are over-prescribed because it is easier for a physician to prescribe patients a pill than it is to provide them with long-term physical therapy. Or, perhaps it is purely due to the fact that the more opioid prescriptions are written, the more money pharmaceutical companies pay out to physicians. This astonishing rate of prescriptions has led healthcare providers to have concerns regarding addiction risks, overdose potential, and insufficient pain management training among physicians. The Prescription Drug Monitoring Program (PDMP) is an electronic database that stores information regarding the frequency and number of opioid prescription medications written by physicians. This allows healthcare providers to see a patient’s prescription history prior to writing a new prescription. PDMPs have been implemented in order to provide a way for health care providers and pharmacists to regulate the over-prescription of opioid medications. Pharmacists are required to enter information on the distribution of opioid-based medications into this database. However, a major problem with this is that pharmacists are entering this information in varying time intervals. Some enter it within five minutes of dispensing the medication, some enter it within a matter of days, but some enter it on a monthly basis. Given this lapse in time, drug seekers may be able to get multiple prescriptions from different physicians without the provider’s knowledge. Not only is real-time data an issue, but state-by-state regulations regarding PDMPs may vary. Many state PDMPs only store prescription data for drugs prescribed within in that particular state. Some states, like Missouri, don’t have an implemented PDMP at all. This presents an issue for those who live near a state border, as the doctor may only see the information stored in their particular state’s PDMP, while a person may be getting prescriptions from another doctor just across state lines. A solution to making PDMPs more effective is for PDMP administrators to have a federal mandate that requires each pharmacist to enter the prescription data into the system as soon as the prescription has been filled. In addition, PDMPs should be available nationwide in order to prevent patients from crossing state lines to go doctor shopping. Standardized requirements for pharmacists’ use of PDMPs can also help spark more conversation between physicians and their patients. Perhaps the patient isn’t doctor shopping, but rather they are simply not receiving the proper care and relief that they are seeking. This can provide the physician an opportunity to recommend alternative forms of pain management that don’t involve addictive substances. On the other hand, if the patient does have a dependence on opioids, this conversation can provide them with an opportunity to ask for help if they are scared to do so. In order for these changes to be effective, both physicians and pharmacists need to become better equipped on how to handle patients who are either addicted to opioids or have a history of addiction so that they can be a helpful resource. Not only should they be knowledgeable about a patient’s history, but they should be more mindful of warning signs of opioid abuse. Physicians should be prepared to offer their patients alternative forms of pain management therapy as well as non-addictive pain medications. Though health care providers may benefit financially from writing opioid prescriptions, the necessary question must be asked. Is the financial gain of an opioid prescription really worth the risk of addiction? More importantly – is it really worth a patient’s life?